Birthplace : Denver, Colorado, U.S.
Constance Elaine Trimmer Willis is an American science fiction writer. 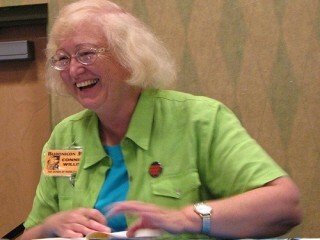 Author Connie Willis has been winning science fiction awards since the late 1980s, including Hugo Awards for the novels The Doomsday Book (1992) and To Say Nothing of the Dog (1998). Influenced by novels of Victorian England and the science fiction of Robert A. Heinlein, Willis began writing full-time in the early 1980s, starting with short stories published in sci-fi magazines. She won the Hugo and the Nebula in 1983 for the novelette Fire Watch, and since then has been a regular winner of the Hugo, Nebula and Locus awards. Although her books involve some sci-fi elements (especially time travel), she is more known for psychological dramas that mix farce with fantasy. Her short stories include "Even the Queen' and "Close Encounter"; her novels include the John W. Campbell Memorial Award winner Lincoln's Dreams (1987), the tongue-in-cheek fantasy Bellwether (1996), the life-after-death drama Passage (2001), the aliens-have-landed comic adventure All Seated on the Ground (2007) and the Hugo- and Nebula-nominated time travel book (in two volumes) Blackout/All Clear (2010). As of 2006 Willis had won 8 Hugos and 6 Nebulas... Willis's short novel Just Like The Ones We Used To Know was made into the 2005 TV movie Snow Wonder (with Mary Tyler Moore).